이두희 대표는 '멋쟁이사자처럼'이라는 단체가 머릿속에 떠오른 2013년에 백수였다. 10년 다니던 서울대학교 컴퓨터공학부를 자퇴하고 거실 소파에서 뒹굴고 있었다. 학원 강사를 할까, 약국하는 친구 옆에서 박카스를 팔까. 도무지 영감이 떠오르지 않았다. 학생들을 위해 멋사는 코딩에 대한 거부감과 편견을 해소해주고, 문과생들과 같은 비전공자도 코딩으로 사회 문제를 해결해 볼 수 있는 기회를 제공한다. 외식경영을 전공하는 학생이 알바 대타를 구해주는 앱을 개발하기도 하고, 문과생이 웹 프로그래밍 기초 수업을 배우기도 한다. 멋사는 구글 임팩트 챌린지 2016에 지원할 당시, 이미 IT 교육업계에서 꽤 이름을 날리고 있었다. 이두희 대표는 무료 코딩 강사를 하며 전국 대학생들로부터 선망을 받고 있었고, ‘천재 해커’라는 수식어는 언론에서 먼지처럼 그의 이름 뒤를 따라다녔다. 하지만 내부적으로 멋사는 ‘멋’을 잃어가고 있었다. 운영진의 사비로 유지되던 단체의 활력은 점점 감소했고, 직원들은 떠나기 시작했다. 이두희 대표는 심지어 2016년 4기 학생들에게 “여러분들은 멋사의 마지막 기수입니다”라는 말로 첫 수업을 시작하기도 했다. 이 대표는 “사실 구글 임팩트 챌린지 공고를 보기 전날까지도 ‘못하겠다’라는 생각을 했어요.”라고 말했다. 마지막 승부수를 던져보자던 게 구글 지원금이었다. 그리고 덥썩 우승을 했다. 5억 원을 받는 순간 심사위원은 1등 팀을 ‘멋진 사자들’이라고 발표했다. “우리야, 우리야? 이게 우리인가? 딴 팀이 있나?” 팀은 긴가민가하며 멋쟁이사자처럼 무대에 올라갔다. 구글의 지원금은 절실히 필요했던 안정을 되찾게 해주었다. 자원봉사자로 일하던 직원들은 월급을 받게 되었고, 긴 호흡이 필요한 사업들은 활력을 잃지 않고 유지되었다. 돈에 급급하지 않고 온전히 질적인 성장에만 집중을 할 수 있게 되었다. 그리고 멋사는 지난 2년간 훨훨 날아다녔다. 코딩 수업 전용 웹사이트를 개발했고, 엄청난 규모의 해커톤을 두 차례 개최했으며(누적 6회) 다양한 계층의 학생들과 교류했다. 국내를 넘어 해외의 학생들까지 총 4,172명을 선발하고 전 세계적으로 130여 개 대학과 협력했다. 다른 수많은 IT 분야와는 달리 남녀 성비율을 최대한 동일하게 유지하고 있다.﻿﻿ 뿐만 아니라, 미국 국무부 및 유네스코와 각각 협업하며 다양한 계층을 위한 교육 프로그램 개발에 노력하는 한편 유엔 NGO 컨퍼런스에 발표자로 나서서 멋사가 진행해온 활동의 사회적 가치를 전하기도 했다. 이와 같은 활발한 활동을 바탕으로 최근에는 2018 벤처창업진흥유공 중소벤처기업부 장관 표창을 수상하기도 했다. 이처럼 구글 임팩트 챌린지 이후 지난 2년간 멋사는 그들의 '멋'을 더 널리 알리고 있었다. 해커톤 6기는 2018년 KBS 아레나홀에서 열렸다. 900여 명의 대학생이 1박 2일간 밤을 새워가며 개발했고, 멋사는 그들을 지도해줬다. 이두희 대표에게 인상 깊었던 결과물 중 하나는 ‘투정’이다. ‘내 삶을 바꾸는 입법안 쇼핑몰’은 서강대학교 김예인 학생이 개발한 사이트다. 사람들이 원하는 법안을 사고 굿즈를 받으면, 투정은 모인 돈을 써서 오프라인 광고를 영향력 있는 장소에 올린다. 사이트에서 제일 인기가 많은 법안은 데이트 폭력 방지 법안이다. 현재 740명 이상이 법안을 구매하여 9백만 원이 넘는 금액이 모였다. 강남역에 올린 광고는 언론의 관심도 받았다. 투정만큼 주목받지 못한 조용한 사례도 많다. 그중 하나는 탈북 청소년의 코딩 교육이다. 2016년부터 멋사팀은 미국 국무부와 협력해 탈북 청소년들을 대상으로 수업을 하고 있다. 지금까지 총 3학기에 걸쳐 30여 명의 학생을 가르쳤다. 이 대표는 “그 친구들과 얘기할 때마다 이런 생각이 들었어요. 같은 공간, 같은 시대에 같은 말을 쓰면서 사는 한국인인데 진짜 완전 다르구나.”라고 말했다. 그들은 탈북하는 과정에서 엄청난 상처를 받았고, 남한에 정착한 후에도 사회적으로 적응할 수 있는 기회가 상대적으로 적었다. 어려운 그래프, 시험에만 나올 자료, 그런 거 다 빼보자. 쉬운 것만 반복하는 수업을 해보자. 멋사는 이런 생각을 되뇌이며 학생들을 가르친다. 현재 구글의 지원금으로 MOOC식의 온라인 코딩 플랫폼을 개발해 1200여 명의 학생이 시범형 ‘유니라이언’을 사용하고 있다. 최종 버전은 내년 초에나 나올 예정이다. 더 발전시키면 일반인과 직장인에게도 공개할 계획이다. 수치화할 수 없는 멋사의 가장 큰 사회적 영향력은 바로 이게 아닐까: 커뮤니티. 컴퓨터 관련 분야를 넘어서서 각계각층의 대학생들이 만나 네트워크를 형성하고 친목을 다지며 아이디어를 개발하는 과정이 바로 참가자들이 얻어가는 가장 큰 가치인 것 같다. 커뮤니티를 독려하는 모습은 커리큘럼뿐만 아니라 이두희 대표의 장난끼 섞인 태도에도 반영되어 있다. ‘백수의 왕, 사자’라는 의미가 무색할 만큼 이두희 대표는 일을 많이 한다. 그는 매일 오후 2시쯤 일어나 새벽 5시까지 일하는, 전형적인 야행성 인간이다. 왜 이 일을 하느냐고 단순하게 물었더니 “재밌어서”라는 단순한 대답이 돌아온다. 학생들과 부딪히는 게, 20대만의 사사로운 문제들 도와주는 게, 고려대 갔다가 부산대 갔다가 이런저런 사람들 만나는 게 다 재미있단다. 그는 학창 시절에는 오늘날 자신에게 붙여진 수식어인 ‘컴퓨터 천재’와는 거리가 멀었다. 어린 시절 코딩을 해본 적도 없고 대학교에선 학점이 1.73, 1.97 위로는 도무지 올라가지 않았다(2.0을 넘어야 졸업할 수 있다.) “나는 컴퓨터랑 안 맞나 보다.”라고 좌절했던 학생이 오늘날 컴퓨터와 거리가 먼 젊은이들을 위해 뛰어다니고 있다. 컴퓨터를 너무 어려워하지 말라고. 정작 본인이 어려워했던 경험이 있기 때문에 학생들의 눈높이에 더더욱 맞출 수 있는 것이 아닐까. 그들에게 뭐가 필요한지, 무엇을 재미있어할지 끊임없이 고민하면서. When the idea of starting Like Lion popped into Duhee Lee’s head in 2013, he was unemployed. He was rolling around in his living room couch after quitting school -- the computer engineering department at Seoul National University, one of South Korea’s most prestigious schools, at which he had struggled for ten years. “Should I become a computer lecturer? Should I work my friend’s pharmacy?” He just didn’t feel inspired about his future. Like Lion is a nonprofit that aims to alleviate the inequality prevalent in South Korea’s IT education. Sure, there are plenty of organizations -- like the for-profit hagwons -- that teach people about coding. But typically they are costly, and students who cannot afford them inevitably fall behind. So Like Lion focuses primarily on university students and charges each participant a small fee of 30,000 Korean won a year (around $25). And Lee left his living room couch behind long ago. Like Lion tries to alleviate students’ stereotypes and fears about coding, and provides non-majors and humanities students with the opportunity to tackle various social problems through coding. For example, a student majoring in food management developed an app that finds quick replacements for part-time jobs; another in the humanities learned the very basics of web programming. When Like Lion applied to the Google Impact Challenge (GIC) in 2016, the organization had already gained a sizeable reputation in South Korea’s IT world. Lee was a local celebrity, revered by university students nationwide for his coding classes, and the term ‘genius hacker’ followed him around in the media like dust. “Literally the day before we saw the Google announcement about a funding opportunity, we were thinking, ‘We can’t do this,’” Lee remembers. In a way, GIC felt like the last time to pull out the sword. And then the team won. When the Google judges announced the grand prize of 500 million won (around $450,000), they called out, “Cool Lions.” “Is that us? Is it someone else?” The Like Lion team walked hesitantly onto the stage. Google’s support gave Like Lion a desperately needed sense of stability. Employees, previously working pro bono, received a proper salary. Projects that needed long-term investments became sustainable. Like Lion was able to focus solely on qualitative development without worrying about where the money would come from. After starting with 30 students at Seoul National University in 2013, Like Lion has collaborated with around 130 universities globally to teach a total of 4,172 students (as of December 2018). In the past two years, the organization also developed UNI-Lion, a customized online lecture platform for its coding students, and hosted two mega-sized hackathons (a total of six since 2013). Unlike many other IT-related ventures, Like Lion tries to keep an equal gender balance. 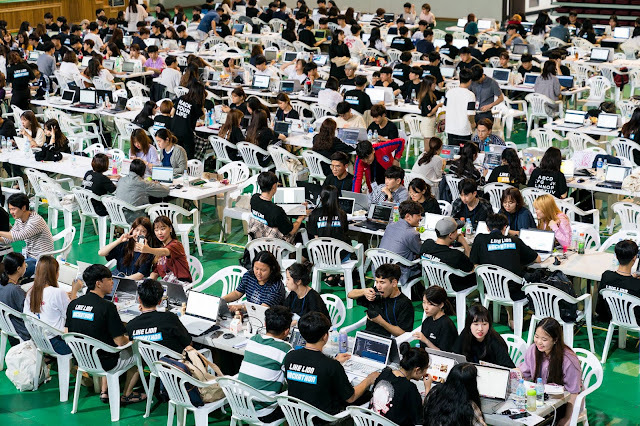 The 6th Hackathon was held in 2018 in an arena hall at KBS, one of South Korea’s largest public broadcasters. Around 900 college students developed their programs, staying up all night under the guidance of Like Lion staffers. To Lee, one of the most memorable student projects from this hackathon was Tojung. Tojung, which means ‘complain’ in Korean, is a “shopping mall for bills that could change your life.” Developed by Yae-in Kim, a student at Sogang University, Tojung offers visitors a list of proposed legislations that they can ‘purchase’ by selecting different reward packages, for example, a cell phone case and a petition at the National Assembly for 15,000 won (around $13). If enough money is gathered, Tojung places an offline ad in an influential location -- like the Gangnam subway in Seoul, where Tojung’s most popular bill about preventing sexual violence was advertised, catching the eye of local media. Not all Like Lion projects receive as much public attention as Tojung. One is the free coding program for young people who have defected from North Korea. Since 2016, Like Lion has been collaborating with the U.S. State Department to teach a cumulative total of 30 students. “Whenever I talk to them, I realize how differently Korean they are. We share the same space and use the same language, but we’re so different,” Lee says. The students’ experiences of escaping North Korea were traumatic, and because of the stigma against defectors, it was harder for many to adapt to a new society in South Korea. For Lee, it was time for the education to evolve too. He wanted to get rid of the difficult graphs that would only appear on exams. He wanted students to repeat tasks that were easy to do and have fun with coding. With all this in mind, Like Lion developed a MOOC-like online coding platform, with the help of Google funding. UNI-Lion is currently at a prototype stage, but is already being used by the approximately 1,200 Like Lion students. The final version is set to launch sometime early next year, and will eventually be released to the wider public. Community: That’s probably the biggest social impact that Like Lion is making, one that cannot be quantified so easily. The biggest value participants derive from the coding programs is the network they forge with each other, through which they share and develop ideas. Like Lion is well aware of this value, and reflects it in the curricula -- it’s visible even in Lee’s mischievous attitude toward his students. “We’re a little different from typical universities, in that we have a very tight-knit community that highly encourages dating,” he says. “The first couple of every season gets a free meal from me.” But Like Lion’s community-forging isn’t just about creating couples; it’s about coding through networking. For example, the first assignment for all the students is to create one’s own website and make it public to all the others. This visibility allows students to find new functions, give each other feedback and reflect on their own work. When looking at how much work Lee does everyday, you forget that his original, self-deprecating idea was to be the “king of unemployment, like a lion.” He wakes up at 2 p.m. everyday and works nonstop until around 5 a.m. Why? He says simply, “Because it’s fun.” He loves meeting different people, working with students and advising them -- not just about coding but all sorts of petty drama peculiar to their youth. When Lee was a college student, he was far from being a ‘computer genius,’ a label that frequently trails behind his name today. He had never coded as a child, unlike so many geniuses hailed in the media, and his college grades just didn’t go above 1.73 or 1.97 (you need 2.0 to graduate). He despaired that he just wasn’t compatible with computers. Perhaps that’s why he’s able to see from the students’ perspectives. He understands deeply what it’s like to feel hesitant in front of a computer. And years after his university days, he is teaching students like him, telling them not to be so scared. Computers are more fun -- and easier -- than you think.